This doujinshi artwork by the amazing artist Ryutaro Hino. He or she specializes in images of Hotaru Tomoe, also known as Sailor Saturn. This art is so good that he only way you know it's NOT official is the volume. There are just not enough pictures of the soldier of destruction. Hino's site This artist has been doing calendars every year since 1998. This image is from the 1999 calendar entitles "Last Illusion." Hence the name. I made the bg myself and the brushes for the gravestones are from Deviant Art. 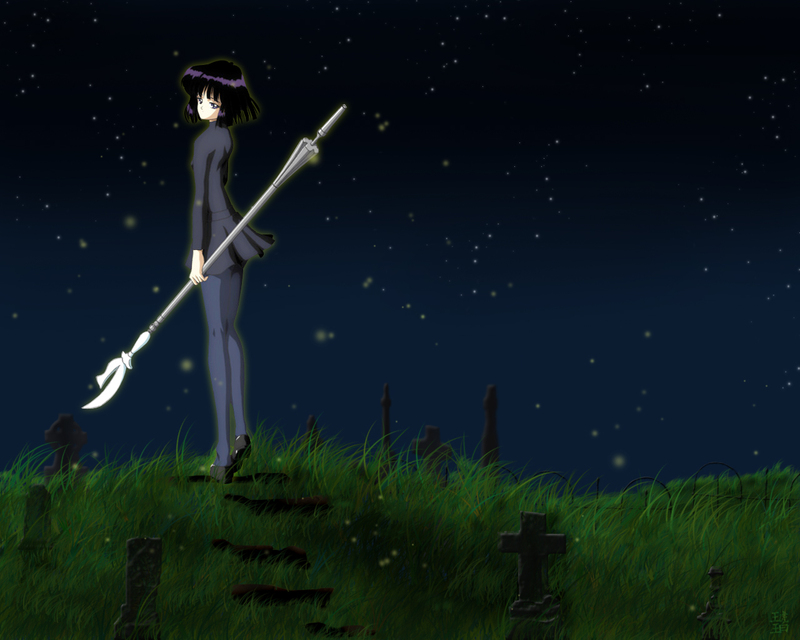 I liked the graves as a subtle way of pointing out that to the other senshi, Hotaru is the harbinger of death. If she emerges as the Messiah of Silence, the world ends. If she emerges as Sailor Saturn, the world will be reset to the beginning of time to start from scratch. It's just achingly obvious that she HATES what is about to happen by the look on her face. I love the image of her in normal clothes holding the glaive. What a wicked cool picture! This is my 2nd scenic wallpaper. Total time is about 6 and a half hours and 32 layers if you include the vectoring to redo her hair. Does anyone else see that she glows like the fireflies around her? Since Hotaru means firefly? Clever, right? Right? I really wanted her to glow so that the work on her hair would show, and that she would stand out from the sky, and be unearthly. Comments and favs loved and appreciated! eek! it's Saturn! the youngest aside from Chibi.. hum.. yeah, i watch Sailor Moon when I was a kid.. it's Sailormoon S when Saturn showed up..
like BlueAngel17 said, it has peaceful feeling rather than haunting. i like how she has a calm face that looks like shes accepting her destiny. the sky does seem to be a bit bland though - maybe a moon? hmm...and it might have looked better if you had a little more fireflies in the grass? or some shooting stars in the sky might have created a more "end of the earth feeling" without totally destroying the peacefulness.